It’s been nearly a year since Microsoft rolled out the Surface Studio and I’ve been more than a little surprised that no manufacturers have rolled out their own version of a pen-enabled all-in-one. And while large pen displays are now available in a wide range of price points, touch capability has been exceptionally rare in all but the premium-priced Studio, the new Dell Canvas and the highest end Cintiqs. Pen display manufacturer Yiynova is attempting to fill both market gaps with the $999 MVP22U+DF & Cloud PC. This fascinating combo consists of a 21.5-inch 10-point touch capable pen display and an Intel Compute Stick with an Atom Z3735F processor, 2 GB of DDR3 RAM and 16/32GB of eMMC storage. And while this “Cloud PC” won’t set any benchmark records, it performs decently enough to run Clip Studio Paint or Sketchable in a pinch. The star of the show is the MVP22U+DF display, which can be purchased without the pc stick for $829. They also sell the Cloud PC separately for $199 but it is not compatible with the HDMI connector in prior models (more on this later). Yiynova’s US distributor The Panda City provided both devices for this review. This is the third Yiynova pen display that I’ve tested and the product hasn’t changed very dramatically from the MVP22U(V2) I first reviewed in 2013. Yiynova is definitely not setting any design trends with its displays. The MVP22U+DF still rocks a 2006-era iMac white plastic face seated inside a black plastic tray. 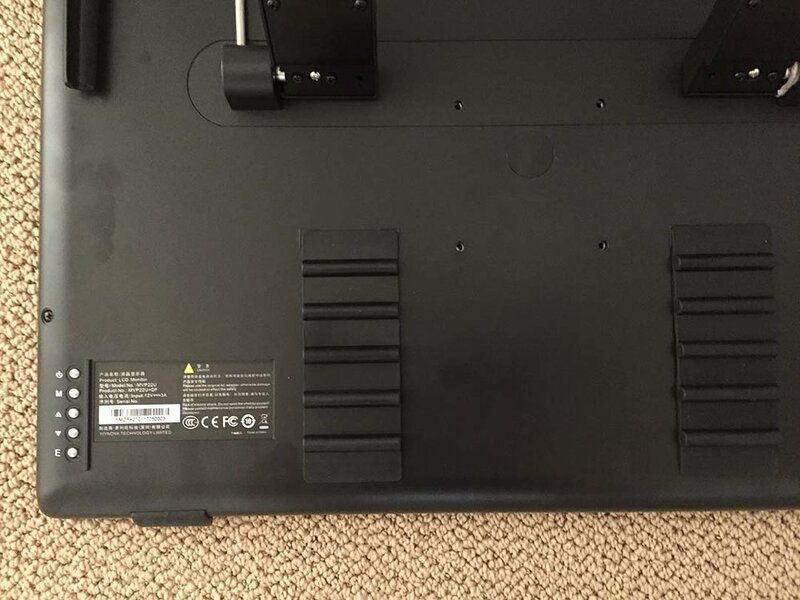 The only differences in the tray are two black rubber stops along its bottom edge that grip the edge of your work table at the stand’s lowest setting and two strips of additional stops that allow you to stably extend the display into your lap. The MVP22U+DF has a USB port on the lower right side of the display for attaching the included hotkey remote. A pen holder on the upper right back clips onto the display. Accessing the ports of most pen displays can be a challenge, with many manufacturers choosing to place their inlets in awkward to reach places. The MVP22U+DF’s power, DVI and powered USB port are all located along the left leg of the stand where it’s less likely for cords to get tangled as the display is raised or lowered. Display controls include a touch on/off toggle (labeled with the down arrow). Two strips of five stops allow you to hang the display off of your desktop if you want to get up close and personal with your work. Display controls including power and menu are located along the lower right rear and a USB port for the included hotkey remote is located on the lower right edge of the display. On Windows 10 devices, connecting the pen display is a matter of connecting the video input and a USB cable for pen and touch. The package ships with an HDMI to DVI adapter. If your PC has another type of output, you’ll need to supply your own adapter. I first intended to test the display on a Dell XPS 8700 tower, but I ran into trouble once I attached the USB cable. The pen device would repeatedly cycle on and off, making the pen unusable for more than a second or two at a time. The Panda City believes the issue is with the cable they shipped but I’m not convinced. The MVP22U+DF has a 5V 3A powered USB port and I believe those currents caused the conflict with my desktop’s USB connections. I subsequently attached the display to my Lenovo Yoga 720 via a HooToo USB C hub and didn’t have any issues. Windows immediately recognized the display as a touch device and installed the necessary drivers. The pen also worked immediately with the standard Windows Ink driver. For older PCs or those needing Wintab support, Yiynova also offers UC-Logic tablet drivers. These offer a lot of features, such as pen pressure control, calibration and shortcut key configuration. The drivers have come a long way but I still find them to be problematic to install and remove. Panda City sent me a lengthy document with all the steps required to remove the tablet driver manually and I think it’s better to avoid installing the driver in the first place unless you’re absolutely sure you need its functionality. And if you intend to run software like Clip Studio Paint, which has a robust tablet pc mode and pen pressure curve settings, I’d say the drivers are best avoided. Yiynova displays ship with a generous assortment of goodies like an artist glove and two battery powered pens with two spare tips and remover. The plastic stylus cases double as clear edge rulers. There’s also the aforementioned hotkey remote, which I’m too lazy to set up and test. Sorry. The surface of the display doesn’t feel like glass; it seems more like plastic. The hard pen nibs glide acceptably on the display but my bare hand tended to stick a little uncomfortably. I installed a removeable matte screen protector I had on hand from a Huion pen display and it made a world of difference. Pen tips glide very smoothly with no hitches and my bare hand doesn’t stick at all. The standard pen (above, bottom) requires 5 g of initial activation force, while the upgraded P2X(V5) (sold separately) requires only 1 g.
The pens shipped with the display are P2X, which support 2048 pressure levels, 4000 LPI resolution and 5 g inking start (what some of us are accustomed to calling the initial activation force). 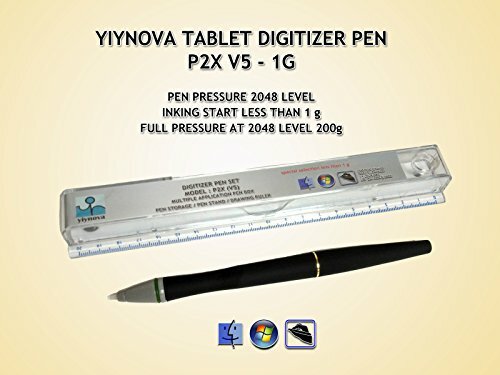 Yiynova also sells a P2X(V5) pen with only 1 g inking start. The pen is only available in limited supply but I purchased one recently and think it is well worth the $50 extra for the lower IAF. All UC-Logic active pens I’ve tested are interchangeable, so the pen can be used on devices from Huion and others. The pens are very comfortable to hold, countoured and rubberized. They feature two large side switches. These pen buttons are a little loose and very easy to trigger accidentally. With or without a screen protector, touch response is excellent. I know some of you are old school and think you don’t want touch capability, but when it works well, you’ll never want to work without being able to pinch and zoom and rotate to your heart’s content. And if your software misbehaves with touch or is too sensitive to occasional glances from your free hand, the display has instant touch on and off button just for you. Tapping the button toggles between the unintuitive “dual touch” and “single touch” modes. Dual touch means pen and touch are active. Single touch means pen is active but touch is disabled. Calibration out of the box was good, with excellent corner accuracy. Parallax between the pen tip and on-screen cursor is pronounced: approximately 1/8-inch. However, it’s very easy to get accustomed to the distance, especially when you’re looking at your display head on. Line quality of the Yiynova is very good. Sticklers will notice some jitter on slow diagonals, but the phenomenon really doesn’t bother me. 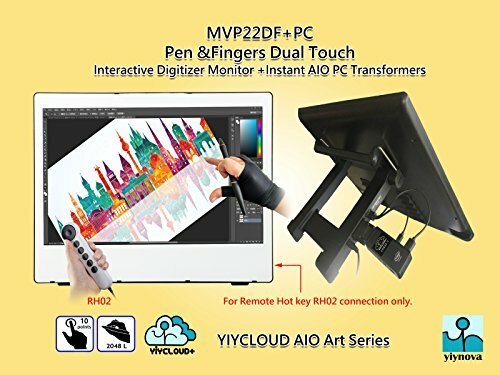 With the addition of a matte screen protector and the P2X(V5) pen upgrade, the MVP22U+DF offers the best inking experience this side of a Cintiq Pro. One slight negative to the design is a hot spot around the display’s LED power light. After a few hours on, the area got quite warm to the touch. This is unfortunate because the drawing area is very cool, but my hand naturally tends to rest right where the display is warmest. Power, DVI and USB inlets are on the display's stand. The Cloud PC attaches via an HDMI to DVI converter and a USB Y-cable. I initially planned to ignore the obviously underpowered Cloud PC for this review, but when I first had trouble connecting the display to my Dell I settled for using the compute stick for a while. Everything about it is kind of kludgey. The compute stick connects via HDMI to the DVI to HDMI adapter. A Y-cable attaches micro USB power and USB 2.0 to the display’s powered USB input. On the flip side of the stick, you can connect another micro USB 2.0 cable and microSD storage. My Cloud PC came configured in Chinese and I spent a full day figuring out how to change the language to English. I could have gotten away with testing as is, but I can never leave well enough alone and I ended up reformatting and reinstalling Windows a couple of times before I got it right. The reformatting is unfortunate because the Cloud PC ships with tablet drivers and some software preinstalled which take a lot of the hassle out of using the display for the first time. Nevertheless, once I had the compute stick up and running I was very pleasantly surprised how well it ran lightweight software like Clip Studio Paint and Sketchable. I wasn’t able to install Autodesk Sketchbook because it’s apparently incompatible with the stick’s display drivers. Do I recommend the Cloud PC for artists? Absolutely not. But if you want to marvel at how much computing power you can cram in to a small package, the $170 - $199 investment isn’t bad. Is the MVP22U+DF & Cloud PC a genuine all-in-one alternative? Absolutely not. But while other OEMs are sitting on their hands, I have to credit Yiynova for attempting an intermediate product. At 21.5 inches, the Windows touch keyboard is nearly full size and using a PC without a physical keyboard is very practical. For most of you, I suspect the standalone MVP22U+DF pen display is the way to go. For $1000 less than the Dell Canvas, it’s a very nice device. There are a couple of non-touch 22-inch pen displays on the market that may cost the same or less, but for me at least, having 10-point touch capability is worth the price difference. For instance, I haven’t tested the Huion Kamvas GT-221 Pro which offers higher pen pressure and a sleeker product design and retails for $899. But since the two displays are built on UC-Logic pen hardware, experience tells me I’d still prefer the MVP22U+DF’s touch support.